Two new Breakout Stocks for Week 7 with better than 10% short-term upside potential. Two Best of the Dow 30 for Week 5 mega-cap selections based on breakout model characteristics are: Merck & Co. and the Coca-Cola Company. Continuing from last year now makes it 77 out of 91 trading weeks (84.62%), with at least one stock move 10% or greater within a 4 or 5 days. Total returns for the Breakout Stock selections since 2017 is 65.07% compared to 16.25% for the S&P 500 over the same trading period. We are still seeing that selling the breakout stocks prior to the end of the fixed 5-day measurement period is the most profitable 1-week strategy. Also as I monitor results for optimal holding periods over multiple weeks on the Breakout Stock spreadsheet for members, I am seeing that the two-week hold through the following Thursday is currently generating the best overall results as positive momentum conditions carry well into second and third weeks. 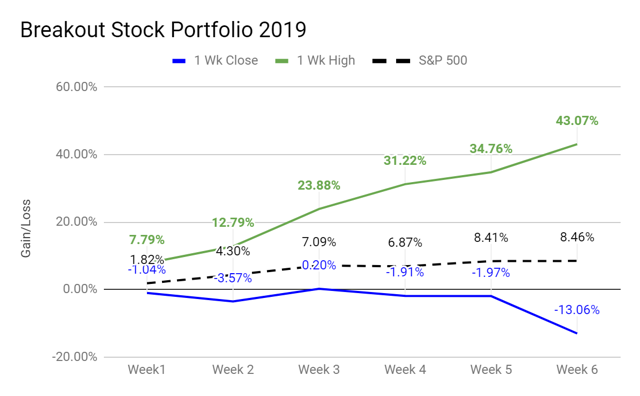 The evidence is strong that you can outperform the fixed 1-week, equal weighted minimum return measurement shown above in the 1 Week Close (blue line). Selling many of the selections prior to Friday has resulted in +43.07% return YTD (green line) compared to the S&P 500 +8.46% for the same period. So far, the returns above represent a distinct pattern among traders in high momentum volatility breakout selections who are exiting positions ahead of the fixed Friday close for the week. As the table shows below for the past 8 selections for 2019, so far, the best returns were generally achieved in fewer than four days with an average top gain of 5.92% per stock. Despite riding high through the week, on Thursday, SGMO failed to deliver on its gene editing study which led to the largest decline in the stock in ten years according to Bloomberg. Idiosyncratic events will occur that the model cannot anticipate, so it is always a good strategy to hold a basket of stocks to diversify unpredictable risks. Momentum conditions remain strongest among Patterson-UTI Energy (PTEN), TechTarget (TTGT), FormFactor (FORM), Net 1 UEPS Tech (UEPS) Keane Group (FRAC), Youngevity International (YGYI), eXp World Holdings (EXPI), Barnes & Noble Education (BNED), and Finjan Holdings (FNJN) from prior weekly holdings. Momentum parameters have continued to remain positive from Week 6 Breakout Selections. For Week 7, the selections begin the week with Momentum values at 46 Positive and 28 Negative. These are some of the highest negative and lowest positive momentum levels we have seen on this gauge this year. 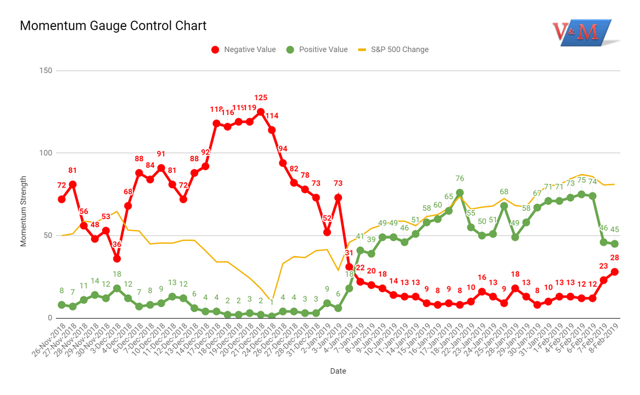 The direction is also signaling steep momentum deterioration as we are nearing the first crossover to stronger negative conditions that we have seen since Week 39 last year (last week of September) prior to the October market correction. The Portfolio Barometer index shows a key inflection point with an increased level of volatility and worsening market conditions across the portfolios in the past week. U.S. stocks had their best January performance since 1987, but ETF investors didn't chase the rally. When all was said and done, they pulled $2.2 billion from U.S.-listed ETFs, the first January outflow since 2015. The relatively modest $2.2 billion outflow for January isn't indicative of the big moves that took place beneath the surface. A whopping $25.5 billion came out of U.S.-listed equity ETFs, largely due to outflows from two funds. The four Breakout Stocks to start the week consist of 2 healthcare, 1 industrial goods, and 1 basic materials stock. Cara Therapeutics, Inc., a clinical-stage biopharmaceutical company, focuses on developing and commercializing chemical entities designed to alleviate pruritus and pain by selectively targeting kappa opioid receptors in the United States. The company is developing product candidates that target the body's peripheral nervous system and immune cells. Insys Therapeutics, Inc., a specialty pharmaceutical company, develops and commercializes supportive care products. The company markets SUBSYS, a sublingual fentanyl spray for breakthrough cancer pain in opioid-tolerant adult patients; and SYNDROS, an orally administered liquid formulation of dronabinol for the treatment of chemotherapy-induced nausea and vomiting, and anorexia associated with weight loss in patients with AIDS. Applying the same breakout model parameters without regard to market cap or the below average volatility of mega-cap stocks may produce similar strong results relative to other Dow 30 stocks. 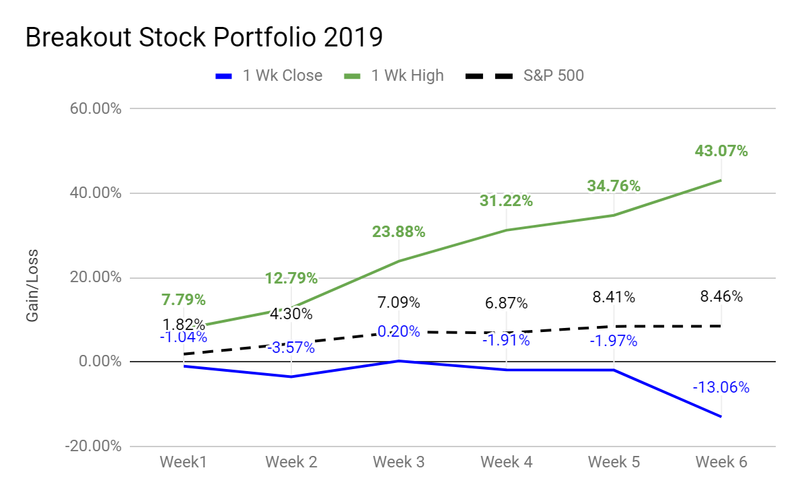 All of these key weekly and monthly selections feed into the Premium Portfolio database selection model portfolio that is now up 13.66% YTD with 17 stocks gaining more than 10%. Disclosure: I/we have no positions in any stocks mentioned, but may initiate a long position in CARA, INSY, MRK, KO over the next 72 hours. I wrote this article myself, and it expresses my own opinions. I am not receiving compensation for it (other than from Seeking Alpha). I have no business relationship with any company whose stock is mentioned in this article.